The acai (pronounced ah-sigh-EE) is a fruit berry of the Amazon palm tree grown in Central and South America. Because of its small and delicate size, transport is often difficult which is why you are most likey to find the acai berry as an ingredient in smoothies or as a juice in the refrigerated section of natural food stores in the United States. The acai has been featured on Oprah and several other television showings. In my recent travels to Rio De Janerio, Brazil of South America, I wanted to experience this superfood. In the local area of Lapa while visiting the world famous Escadaria Serlon Steps, I was able to get the acai in a smoothie at a local juice bar. Although, I did not experience the acai in its natural fruit berry state, it was plenty tasteful! I found that the fruit had an energizing refreshing taste that blends chocolate and berries. 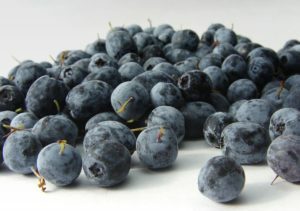 Its deep royal purple color is where all the hidden energizing amino acids, anti-oxidants, and fatty acids are held. You may not be able to find this super fruit in your local supermarket, but you should be able to find it at a farmers market or health food store most probably in juice form.